While the current building is the third chapel to be built at the site, the Circular Congressional Church has a long rich history that spans the centuries, and predates the state of South Carolina itself. The congregation was formed in 1681, and was comprised of English Congregationalists, Scotch and Irish Presbyterians, and French Huguenots who dissented from their previous faiths and created a new church, which they called the "Independent Church" in 1681. The first building to hold this congregation was constructed sometime before 1695, and was known to the community as the "White Meeting House." Years later, the street where this original structure sat would adapt the church's moniker and become known as "Meeting Street." A second meeting house was constructed in 1732, and in 1806, this building was replaced by a circular chapel designed by famous architect Robert Mills. Mills, a Charleston resident, was at the beginning of the century-long wave of famous architects who would change the Charleston landscape with their groundbreaking designs and buildings. In fact, Mills is considered by many historians to be one of the first professionally trained architects in America. His design for this 1806 structure was a far cry from the standard boxy chapels, and instead was a circular towering building, 88' feet in diameter with 26 windows, which would lead to the former White Meeting House's name change to, naturally, the Circular Congressional Church. During this unique church's heyday, roughly from 1820 through 1860, the Circular Congressional Church had a large congregation of both white and black members that revolutionized church services in the state. The first Sunday school class in South Carolina began here in 1816, and the enthusiastic members also founded one of the first bible studies in the country, the Charleston Bible Society, which boasted a host of prestigious members including two South Carolina governors. 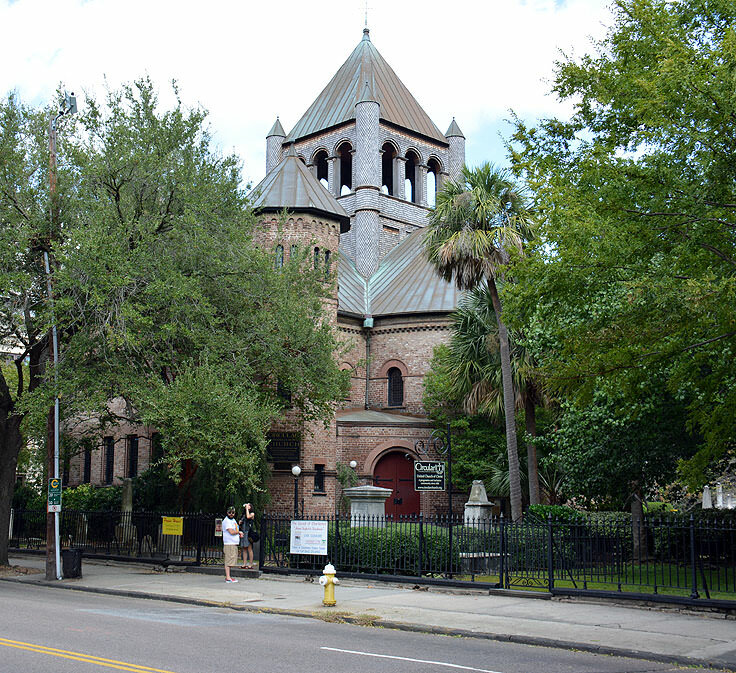 Unfortunately, this unique and legendary structure was lost to history with an 1861 fire that damaged it beyond repair, followed by an 1886 earthquake, which destroyed a large chuck of Charleston and destroyed the ruins of the church completely. The site stood barren until a new architect, Henry Hobson Richardson, was called in to create a home for the displaced congregation. The new structure, completed in 1892, was more complex than circular, and was designed and built in the Romanesque style, with a broad roof plane, ribbons of windows and openings, a short tower, and a large arched entry. An impressive building inside and out, the church is open to the public Monday through Friday, 8:30 a.m. to 12:00 p.m., with tours happily offered whenever a tour guide is available on site. The church still has an enthusiastic and large congregation that meets every Sunday for service, and throughout the week for bible studies and special programs, which can include everything from yoga classes to parenting forums. A complete calendar of events can be found online at http://www.circularchurch.org/, and new members or visiting patrons are always welcome to attend the public services and group gatherings. Behind the church, and bordering the wide circular base, lies the Circular Congressional Church's famed cemetery, which holds the honor of being the oldest burial grounds in South Carolina. More than 500 gravesites and 150 markers can be found here, dating all the way back to Charleston's first settlements - in fact, the 1675 marker at the cemetery is the oldest known gravesite in the entire city. Somberly beautiful, the cemetery bears the scars and stories of Charleston's history, from the early colonists to the Civil War. This is evident by both the dates on the grave stones, as well as other telltale signs, like a local grave that is missing a chuck of slate - an abnormality that is thought to be caused by a passing mortar shell during the height of Charleston's involvement in the Civil War. Visitors are free to tour the cemetery at will, provided they show all due respect, and a number of historical walking tours also take regular trips to the site, with guides pointing out the famous and oldest residents. In addition, seasonal visitors will also find a number of nighttime ghost walks available, where the cemetery is spookily illuminated under the city lights, yet almost hidden under tangles of oak trees and Spanish moss. A must for anyone who loves a great ghost story, a number of tour businesses can provide both daytime and nighttime strolls through this historical Charleston landmark. The Circular Congressional Church, like many of Charleston's famed Meeting Street landmarks, holds a place in history for a multitude of reasons.Home to one of the South's oldest cemeteries, an architecturally impressive chapel, and one of the most revolutionary congregations in the United States, it's no wonder that this site is a fascination for visitors of all denominations. 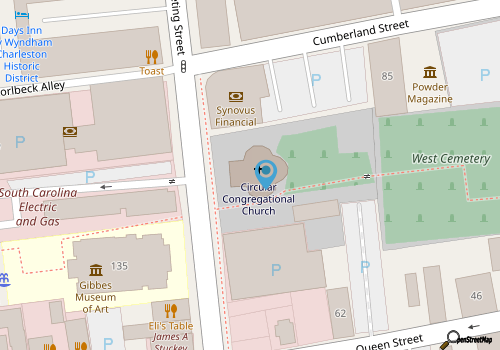 Stop in for a Sunday service, or simply make sure this building and burial grounds are on your checklist for historic downtown attractions, and experience Circular Congressional Church - one of many unique aspects and legendary buildings that comprise this equally legendary city.